Beijing opera, more commonly known as Peking opera to westerners, is deemed the national opera of China. The accompanying music, singing and costumes are all fascinating and artistic. Full of Chinese cultural facts, the opera presents to the audience an encyclopedia of Chinese culture as well as unfolding stories, beautiful paintings, exquisite costumes, graceful gestures and acrobatic fighting. Since it enjoys a higher reputation than other local operas, almost every province of China has more than one Beijing Opera troupe, who is called "piaoyou" in Chinese. This kind of opera is so popular among Chinese people, especially seniors, that even a "Beijing Opera Month" has been declared. It has existed for over 200 years. It is widely regarded as the highest expression of the Chinese culture. It is known as one of the three main theatrical systems in the world. 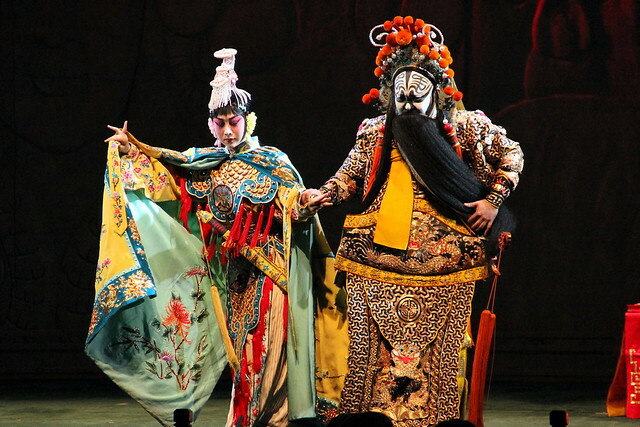 Artistically, Beijing Opera is perhaps the most refined form of opera in the world. It has deeply influenced the hearts of the Chinese people. Although it is called Beijing Opera, its origins are not in Beijing but in the Chinese provinces of Anhui and Hubei. Beijing Opera got its two main melodies, Xi_Pi and Er_Huang, from Anhui and Hubei operas. It then absorbed music and arias from other operas and musical arts in China. In the ancient times, Beijing Opera was performed mostly on open-air stages in markets, streets, teahouses or temple courtyards. The orchestra had to play loudly and the performers had to develop a piercing style of singing, in order to be heard over the crowds. The Beijing opera band mainly consists of orchestra band and percussion band. The former frequently accompanies peaceful scenes while the later often follows scenes of war and fighting. The commonly used percussion instruments include castanets, drums, bells and cymbals. One person usually plays the castanets and the drum simultaneously, which are the conductor of the whole band. It is said that the facial painting art derived from the Chinese opera has different origins. But no matter what its origin is, the facial painting is worth appreciating for its artistic value. The paintings are presentations of the roles of the characters. For example, a red face usually depicts the role's bravery, uprightness and loyalty; a white face symbolizes a sinister role's treachery and guile; a green face describes surly stubbornness, impetuosity and lack of self-restraint. In addition, the pattern of the facial painting reveals the role's information too. In a word, the unique makeup in the opera allows the characters on the stage to reveal them voicelessly. Liyuan Theater inside Qianmen Hotel in Beijing is an ideal place for you to enjoy some Beijing Opera. About the Author: Jin Huang has an interest in Chinese Culture related subjects.